For convenience I have used the four discipline-based categories: biomedical sciences, chemical, physical and mathematical sciences, engineering sciences and social sciences. And within each discipline I have clustered the scientists into three groups: (1) pioneers (born before 1920), (2) first generation (born between 1920 and 1939), (3) second generation (born between 1940 and 1958). This essay is dedicated to the memories of two Tamil scientists and institution builders, Lieut. Col. Appaiah Annai [I. Rasiah from Manipay] and Prof. S. Raveendranath, who were abducted by para-militaries affiliated to the Sri Lankan army and put to death. For the record, Appaiah Annai, abducted on Dec. 24, 1997, was a home-grown weapon systems-tinkerer and improviser, whose professional qualification is tagged as garage mechanic. Prof. Raveendranath, abducted on Dec.15, 2005, was an agricultural pest entomologist. More than ten years ago, I contributed five short essays to the multi-volume Biographical Encyclopedia of Scientists (edited by Richard Olson, Marshall Cavendish Corp., New York, 1998). This was a five volume compilation profiling 472 representative figures in the history of scientific investigation. Among its 182 contributors, I was commissioned to cover five, four of whom were Nobelists in science (namely Kenichi Fukui, Shibasaburo Kitasato, Karl Landsteiner, Shinichiro Tomonaga and Hideki Yukawa). As I was residing in Japan, the editor offered me to cover the lives of four well known Japanese scientists. (KBGs), and three among these eight were chemistry Nobelists. (Sri Kantha, 1992a, 1992b). This study also attracted notice by a peer physiology columnist (Tenney, 1993). These interests led me to the idea that I should endeavor to collect publication details of notable Sri Lankan Tamil scientists, which remain dispersed and inaccessible. This essay is a front runner of this project, and is not meant to be all inclusive. I have identified 90 Tamil/Muslim scientists, who were born between 1895 and 1958. If the achievements of other published Tamil/Muslim scientists have been omitted or slighted, it is mainly due to my ignorance and lack of access to their published record. This essay has been in preparation for the past two years. I have had the benefit of input from physician Nages Nagaratnam (born 1926, currently residing in Australia) and another Tamil scientist who wishes to remain anonymous. I note that these two have added valuable details to this essay on themes that I am not familiar with. First I begin with an email correspondence I had with Dr. Nagaratnam. I provide excerpts of an e-mail I sent to him on February 24, 2007. “Last month when I searched the net, I came across the National Academy of Sciences of Sri Lanka site. I had heard about it, but didn’t take much interest in the past. When I read through the ‘Academicians’ list, I was pleasantly surprised to find your name. Sure you deserve to be among the elites. You have been inducted 30 years ago. Can you provide some information about this National Academy for me? 1. When was this Academy established? 2. How many were the original ‘founder members’? And on what basis, did these original ‘founder members’ constitute themselves for the Academy? I find a few names listed with the tag as ‘founder members’? 4. Can you provide me a list of Tamil/Muslim scientists (from your memory) who have been elected to this Academy? “The National Academy of Sciences of Sri Lanka [NAScSL] was established in 1976. The Act relating to the NAScSL was passed in parliament only in 1988. I do not know who the founder members were. Only living founder member is Dr. A.S. Kunasingham, BS, MS(Hawaii), PhD (Hawaii)/ agriculture economics – development economics. The first President was Prof. Milroy Paul. I was elected the following year 1977, and was the first clinician and non-academic to be made a Fellow. My name was proposed by Prof. K.N. Seneviratne, then professor of physiology and supported by Prof. C.C. de Silva, Prof. Milroy Paul. There is an election every year by the General Assembly of new Fellows not exceeding 15 in a given year. Each nominee shall be proposed and recommended by a certificate in the form prescribed by the Council, signed by three Fellows one of whom shall be the proposer, one seconder and the third supporter. Three cut-off criteria were adopted for inclusion in this survey. First, it is limited to only those who were born either by the end of 1958 or with a research career span (~25-30 years). Secondly, it is also limited to those who completed their education at a high school/university in Sri Lanka. Thirdly, only those scientists who have published in the journals indexed by the Institute for Scientific Information (ISI) Web of Science have been included. I am aware that there are numerous computer scientists/engineers/physicians who work in industries and for-profit Institutes who have admirable research credentials, including patents. Due to difficulties gathering their information, these scientists have been excluded here. One would suggest some additional reasons for the elevation of scientist in the lexicon: call it the ‘Einstein effect’ and or ‘Nobel effect’. The Nobel prizes established in 1901, as well as the popularity of Einstein’s relativity theory that captured popular imagination in 1919, contributed much to the prominence of scientists in society. Heilbron also records that when the first edition of the reference work American Men of Science appeared in 1904, there were 4,000 entries. By 1930, the number of entries had increased to 20,000. At the local level, a chronological record of institutionalization of science in colonial and independent Ceylon is given below. Scientists who were affiliated to any one of these institutions – other than the CAAS – became what I tag the pioneers (born before 1920), first generation (born between 1920 and 1939) and second generation (born between 1940 and 1958) scientists on the island. 1870 – Founding of a medical school in Colombo. 1876 – Establishment of the Colombo Museum. 1900 – De Soyza Bacteriological Institute established in Colombo, which later morphed into Medical Research Institute (MRI) in 1946. 1910 – Rubber Research Institute (RRI) set up at Agalawatte. 1912 – Department of Agriculture (DOA) established. 1918 – Tea Research Institute (TRI) established at Talawakelle. 1921 – Ceylon University College organized. 1928 – Coconut Research Institute (CRI) set up at Lunuwila. 1942 – University of Ceylon came into existence, following the proclamation of Ceylon University Ordinance No. 20 of 1942. This act incorporated the Ceylon Medical College and Ceylon University College into a single institution. 1944 – Establishment of the Ceylon Association for the Advancement of Science (CAAS), which later changed its name into the Sri Lanka Association for the Advancement of Science. 1955 – Establishment of the Ceylon Institute of Scientific and Industrial Research (CISIR). 1958 – Elevation of Vidyalankara and Vidyodaya Buddhist Colleges to university status. For a long time, Tamil natural scientists were excluded in the hiring process of these two universities. 1972 – University of Sri Lanka constituted under the one university scheme, according to the University of Sri Lanka Act (No.1) of 1972. Katubedda Technical College converted to a campus of this single university. 1974 – The Jaffna Campus set up as a wing of University of Sri Lanka. 1981 – Batticaloa University College established, which morphed into Eastern University, Sri Lanka in 1986. A proper definition of science consists of three interlinked objectives: a study of the physical and/or natural world based on empiricism, communication (open exchange of data and ideas) and criticism (devotion to an attitude of skepticism) (Holden, 1998). Simply stated, the primary function of scientists is to conduct research and place their findings in the public record for acceptance and criticism by peers through communication via appropriate academic journals. More than 8 years ago I received a reprint of a beautiful essay by Harvard University’s bacteriologist Bernard Davis (1916-1994), published posthumously in 2000, from his wife Elizabeth Davis. In this 13-page essay entitled ‘The Scientist’s World’, Davis touched on the multiple facets of a scientist’s life. I reproduce two paragraphs on scientific writing from this essay for their relevance and to illustrate how a scientist’s stereotyped writing differs from those of others (fiction writers, journalists, lexicographers, musicians, poets and playwrights) who practice writing. “A scientific paper is an unusual art form. It has to be as compact as possible, while giving the reader all the information needed to repeat the experiments. Because the literature is vast, the format of a paper is standardized so the reader can quickly find the parts that interest him; readers skim most of the papers that they look at, except those very close to their interests. The aim is efficient, impersonal transmission of the essentials, rather than a narrative account of the steps along the way. The personal aspects of the process of discovery are therefore usually left out, though they may appear when the material is presented in a lecture. Total publications = The number of research publications that have appeared in the journals which are indexed by the Institute for Scientific Information (ISI), currently operated by Thomson Associates. Merit: Total publications measures productivity. Demerit: it does not measure importance or impact of publications. Total citations = The number of citations by other researchers, to a published paper, review, commentary or letter, that have appeared in the journals indexed. The underlying assumption here is that a publication that fetches higher number of citations deserves respect, and indicates the ‘popularity’ of this publication. ‘Popularity’ is a fluid indicator at best that may reflect factors such as importance of findings, dissemination mechanism, ‘crowdedness’ of a particular research field, visibility and prestige of the journal that carried the particular publication. Merit: Total citations measures total impact. Demerit: this parameter may be inflated by a small number of ‘big hits’ that may not be representative of the researcher if he or she is a coauthor with many others on those papers. h-index = A relatively recent index proposed by Jorge E. Hirsch, that quantifies a scientist’s research output. (Ball, 2005, 2007; Hirsch, 2005, 2007). The h-index combines the total publications and total citations of an individual author. According to Hirsch, “A scientist has index h if h of his or her number of papers (Np) have at least h citations each and the other (Np-h) papers have (<h) citations each. Some notable limitations, identified by Hirsch for this parameter are, (1) ‘a high h is a reliable indicator of high accomplishment, the converse is not necessarily always true.’ (2) ‘Different disciplines have different citation patterns’. As such, inter-disciplinary comparison of h-index among researchers is questionable. (3) ‘A scientist with a high h achieved mostly through papers with many coauthors would be treated overly kindly by his or her h.
Citations per paper = Its merit is that this parameter allows comparison of scientists of different eras. One demerit is that it rewards low productivity and penalizes high productivity. At best, the quantified numbers representing the four bibliometric indicators indicated above are two dimensional at best, like a photograph of a person. For the elusive third dimension, one needs to evaluate the entire career of each scientist. I recognize seven pioneers among Eelam Tamil scientists. These are, Chellappah Suntheralingam (1895-1985), Samuel Victor Ousmond Somanader (1897-1978), Chellappah Amirthalingam (1903-1982), Arumugam Wisvalingam Mailvaganam (1906-1987), Velupillai Appapillai (1913-2001), Christie Jayaratnam Eliezer (1918-2001) and Albert Arthur Hoover. All except Somanader were founding professors (or lecturers) at the University of Ceylon in their respective disciplines. Unfortunately, at the moment, I lack the birth year-death year details of Prof. Hoover, a teacher of mine during 1973-74, who also then functioned as the honorary patron of the University of Sri Lanka (Colombo Campus) Tamil Society, during my tenure as its president (1974-75). I wish that I had asked him for more details about his early reminiscences. Somanader, I recognize, as one of the two Sri Lankan Tamil scientists born in the 19th century. He had been an amateur naturalist in the traditions of Charles Darwin and Alfred Wallace. Apart from his interests in nature observations, Somanader had varied interests like journalism and photography. For over 30 years he earned his living as a school teacher at the Batticaloa Central (Methodist) College and functioned as its principal in the last decade of his teaching career. As such, all of Somanader’s solitary publications appeared in local journals, and are not catalogued in the ISI Web of Science. C. Suntheralingam, the other Sri Lankan Tamil scientist born in the 19th century, had a colorful and controversial career as a politician, MP for Vavuniya, cabinet minister in the first parliament of post-independent Ceylon, pamphleteer and rabble-rouser. It should not be forgotten that Suntheralingam was a mathematician by training and was the first professor of mathematics at the Ceylon University College from 1921 to 1940. C. Amirthalingam, a younger sibling of Suntheralingam, was one of the first scientists (if not the first!) from colonial Ceylon to publish in the Nature journal. After a short career as the Director of Fisheries in the island, Amirthalingam moved to Sudan and was affiliated to the University of Khartoum for long. It is also notable that three among the seven pioneers identified here had the fortune to have Nobel laureates in science as their mentors during their higher degree studies in UK. Mailvaganam trained under C.T.R. Wilson and the great Ernest Rutherford. While Appapillai worked with P.M.S. Blackett, Eliezer had Paul Dirac as his mentor. The scientific productivity of these seven pioneers (except that of Somanader) was numerically lower. This is understandable because all of them had to exert their energy in functioning as institution builders, administrators, teachers and cultural icons of their community in social service. 25 scientists are identified in the first generation category. Lower productivity of many can be attributed to the same non-research functions identified for the pioneers. It should be noted that atmospheric physicist S. Gnanalingam was a son of pioneer C. Suntheralingam. Biomedical sciences: Siva Chinnatamby, N. Nagaratnam, Shan S. Ratnam, S. Sentheshanmuganathan, R. Kanagasuntheram, K.D. Arudpragasam, K. Balasubramaniam, S. Balasubramaniam, K. Sivapalan, M.R. Jainudeen, S. Sotheeswaran, A.H. Sathananthan, P. Sivapalan, V.K. Ganesalingam, Navam Hettiarachchy. Chemical, Physical and Mathematical Sciences: M.U.S. Sultan Bawa, S. Gnanalingam, M.A.V. Devanathan, M. Sundaralingam, R.S. Ramakrishna. Engineering Sciences: K. Arulanandan, S.T. Ariaratnam. Social Sciences: S.J. Tambiah, S. Arasaratnam, S. Thananjayarajasingham. 58 scientists are identified in the second generation category. While the pioneers and the first generation types have predominantly restricted their main research location to Sri Lanka and the UK, the second generation became more international and expanded their research territorial range to other English speaking countries (the USA, Canada, Australia, New Zealand, and Singapore), as well as non-English speaking European and Asian countries. Chemical, Physical and Mathematical Sciences: M. Singham, P. Kathirgamanathan, S. Surendrakumar, G.C.J. Fernandez, S. Hariharan, V.S. Manoranjan, S.S. Sritharan, A. Thavaneswaran, V. Jeyakumar, S. Sivananthan. Engineering Sciences: S. Naguleswaran, A. Kumar David, A.S. Balasbramaniam, D.J. 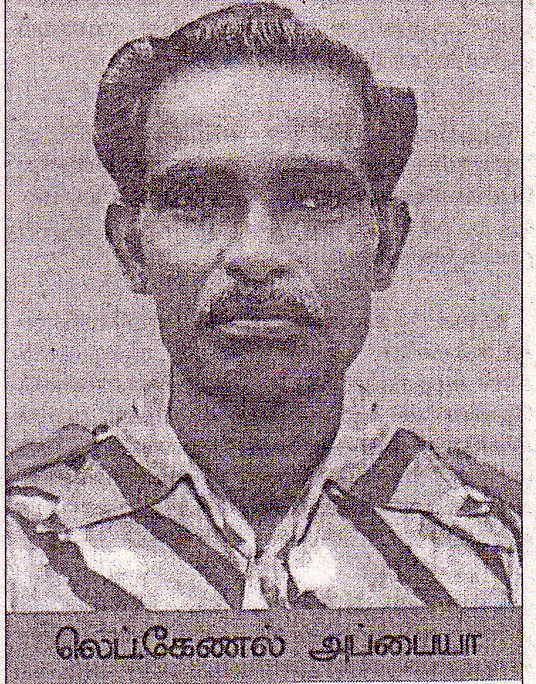 Gunaratnam, S. Sivasegaram, A.P. S. Selvadurai, S. Selvalingam, V. Thevendran, R. Srikanthan, J.G. Shantikumar, Indira V. Samarasekara (nee Arulpragasam), S. Vigneswaran, T. Sritharan, S.R.H. Hoole, S. Parameswaran, R. SriRanjan, M. Sivapalan, C. Sriskandarajah, A. Anandarajah, K.S. Sivakumaran, R. Siddharthan, N. Sri Namachchivaya, C. Vipulanandan, M. Mahendran. Social Sciences: Radhika Coomaraswamy, N. Shanmugaratnam, A. E. Selvanathan, S. Selvanathan. For each of the 87 scientists identified in this essay (excluding three pioneers: Suntheralingam, Somanader and Appapillai), I provide four personal parameters (year of birth and year of death [if known] within parenthesis following the name: productivity span (PS): research specialty (RS) and main research location (MRL). For quite a number of scientists even the year of birth (YOB) is tentatively guessed and noted with a question mark(?). Personal details of scientists are hard to assemble and had been gathered from my personal knowledge, collections and recorded memories. Even a simple statistic relating to YOB (and year of death/YOD) has been left unfilled, if not known for sure. A few to whom I have corresponded, failed to respond to my query and one or two were reluctant to divulge their YOB. The four parameters of scientific productivity included are: total publications (TP), total citations (TC), h-index and citations per publications (C/P). These four bibliometric indicators are valid as of Dec.31, 2008, according to the publications indexed in the ISI Web of Science database. From Archimedes to Einstein, scientists have been born-travelers and peregrination is one of their traita; this has been so for the Tamil scientists in the 20th and the 21st centuries – fleeing from persecution, discrimination and looking for work opportunities at research centers that have been willing to accept them for their merits. As such, the most recent work site of each scientist is provided adjacent to MRL, as far as these can be ascertained from their place of publications, Google-based information and personal knowledge. The names of scientists are arranged tentatively according to the YOB, within each of the four main categorical divisions. I apologize that I have not included the bibliometric details of a few scientists whom I have known individually for technical reasons. These include, Prof. C. Sivagnanasunderam, Prof. A. Jeyaratnam Wilson, Prof. A. Thurairajah, Prof. Mano Sabaratnam, and Dr. Velmurugu Ravindran. Common surnames like Balasubramaniam, Ravindran, Sivapalan and even Srikantha(!) are shared by Tamils living in India, Sri Lanka and elsewhere. These Hindu names having the same single letter initials become homonyms and get pooled together in the scientific databases programmed with a Christian naming pattern having multiple letter initials in mind by the indexers and cataloguers. Lately in the correspondence pages of the Nature journal, Hindu scientists (from India and Singapore), Buddhist scientists (from Japan) and even Muslim scientists have complained about the vagaries of such Christian based name programming in databases. Unless one is sure about research specialty and work location of each scientist, it becomes a tussle to loosen the knots of individual achievements. The bibliometric indicators of two deceased scientists are of noticeable grade. Gynecologist-obstetrician Shan S. Ratnam (1928-2001) has the highest number of research publications, amounting to 554, with 4,226 total citations and an h-index ranking of 30. Biochemist-crystallographer M. Sundaralingam (1931-2004) has the best all-round indicators, with 364 publications, 14,743 total citations and the h-index ranking of 61. While visiting his homeland, Sundaralingam lost his life prematurely on Dec. 26, 2004 to the Big Tsunami that struck Trincomalee. Though the current list is dominated by male scientists, mention should be made about a few female scientists who have raised their status against parochialist interests such as sexism, racism and casteism. I recognize Dr. Siva Chinnatamby (1920-2001) as the foremost woman pioneer among Sri Lankan Tamil scientists. The track records of Navam Hettiarachchy (nee Mylvaganam) and Indira Samarasekara (nee Arulpragasam) currently active in North America do have meritorious status. Professor Indira Samarasekara is currently serving as President of the University of Alberta, Canada, a feat never before achieved by a Sri Lankan scientist, male or female. These inferences appear in the final chapter [‘What does it mean for You?’] of Anne Roe’s book. The numbers provide a measure of each individual scientist’s “driveness” and “professional accomplishment.”, whether one is decorated with a Nobel prize or a Fellowship in any of the Academy of Sciences. But wisdom also dictates that one shouldn’t be a slave to numbers! In this aspect, what was presented in the first chapter [‘How this Research Study Developed] by Anne Roe also deserves attention. She emphasizes that scientists are ‘free people’ and they care for much for this freedom. To quote, “Research scientists usually are in a position to control their own work and this is one of the reasons, I think, why they derive such tremendous gratification from it.” This issue of freedom also explains the peregrination issue of why such a number of pioneers (such as Amirthalingam and Eliezer), first generation and second generation scientists belonging to Tamil ethnics from Sri Lanka, have bothered to escape from the manacles of state oppression, restriction and discrimination. Appaiah Annai’s primary job was not “college teaching”, but vehicle repair. Nevertheless, he was a teacher in weapon systems-tinkering and improvising to his young cadets. Appaiah Annai didn’t have a Ph.D, but neither did Thomas Edison nor the Wright Brothers. Those who read the short sketch of Appaiah Annai’s career that appeared in the Oru Paper (London) of Dec. 27, 2008 can be impressed by his ‘never give-up spirit’ of a scientist. One final note: In the absence of any other comparative scale similar to that of the ISI-Web of Science database, this has been used here for inventory. It should not be forgotten that the total publications (TP) counted in the ISI-Web of Science database has to be taken as optimal productivity of each scientist, as the journal selection criteria for this database has an exclusivity bias. But, the maximal productivity of each scientist included here is higher than that of the TP counted in the ISI-Web of Science database. To illustrate this issue, I present my case as a representative example. I have 14 published papers in peer reviewed journals (5 in Ceylon Medical Journal, 2 in the Journal of National Science Council of Sri Lanka, 1 in Jaffna Medical Journal, 3 in Asian Medical Journal/Japan, 1 in Connective Tissue Research/Japan and 2 in Nutrisyon/Philippines), none of which has been included in the ISI Web of Science database. Technically, none of the scientific journals published in Sri Lanka are included in the ISI-Web of Science database. As such, the TP scores of the pioneers and many of the first generation scientists included in this list do suffer from this exclusion bias. For instance, S. Raveendranath’s optimal productivity in terms of TP is only one. But I’m aware that his maximal productivity is more than one. On being reproached that his formula of gravitation was longer and more cumbersome than Newton’s, the great Einstein responded with a quip, ‘If you are out to describe the truth, leave elegance to the tailor.’ [Mackay, 1992]. In the spirit of Einstein, I infer that the details presented on the productivity of Sri Lankan Tamil scientists, born between 1895 and 1958, as measured by the currently accepted yardsticks, present the apparent truth, and elegance has been left out for tailors [such as the National Academy of Sciences of Sri Lanka] who promote parochial interests and politics. Though some of the Tamil scientists included in this survey had been elected as Fellows of the National Academy of Sciences of Sri Lanka in the past, based on evidence of scientific productivity, it is a given that - as it has been constituted now - entry into this Academy appears doomed for the majority of the other Tamil scientists who were born in post-independent Sri Lanka and have been laboring on the island or elsewhere. To conclude in a lighter vein, here is a quip about the plight of a most prolific Creator and discoverer, recorded two decades ago. “If God applied for a research grant to develop heaven and an earth, He would be turned down nowadays on the following grounds: (1) His project is too ambitious. (2) He has no previous track record. (3) His only publication is a book, not a paper in a refereed journal. (4) He refuses to collaborate with his biggest competitor. (5) His proposal is all up in the air.” [Anon, 1989]. The punchline of this joke is that even God is bound to get rejections from the gatekeepers of science. Like in other competitive fields, the life of a harried and harassed Tamil scientist is filled with rejections, disappointments, competition for shrinking research budget and lack of adequate recognition in one’s home country or adopted country. Despite these handicaps, the souls who endeavor to chase their dreams and show leadership skills to the younger generations deserve some recognition, and this essay is a tribute to the spirit of such trendsetters. It will indeed be a fruitful exercise, if an attempt is made subsequently to prepare an inventory of scientific productivity of younger Tamil scientists (born since 1958) who are currently making their grade in research. Amaradasa RMW, de Silva MAT: The evolution and structure of science and technology in Sri Lanka. Science Technology Society, 2001: 6(1): 179-201. Amarasuriya NR: Scientific journals of Sri Lanka. Information Development: 1991: 7(4): 204-207. Anon: The powers that be. Chemistry in Britain, 1989: 25: 663. Ball P: Index aims for fair ranking of scientists. Nature, 2005: 436: 900. Ball P: Achievement index climbs the ranks. Nature, 2007: 448: 737. Cook, H et al. Journals under threat: a joint response from History of Science, Technology and Medicine editors. Medical History, 2009; 53: 1-4. Davis, BD: The Scientist’s World. Microbiology and Molecular Biology Reviews, 2000; 64: 1-12. Heilbron JL: Creativity and big science. Physics Today, 1992 Nov.: 42-47. Hirsch JE: An index to quantify an individual’s scientific research output. Proc. National Acad. Sci. USA, 2005: 102: 16569-16572. Hirsch JE: Does the h index have predictive power? Proc. National Acad. Sci. USA, 2007: 104: 19193-19198. Holden C: Defining ‘Science’ for the People. Science, 1998; 280: 663. Mackay AL: A Dictionary of Scientific Quotations, Institute of Physics Publishing, Bristol, 1992, p.81. Roe A: The Making of Scientist, Dodd, Mead and Co, New York, 1953, pp. 1-17 and 230-244. Siekevitz P: Low citation rates – who is to blame? FASEB Journal, 1991: 5: 2217. Sri Kantha S: Productivity drive. Nature, 1992a; 356: 738. Sri Kantha S: Clues to prolific productivity among prominent scientists. Medical Hypotheses, 1992b; 39: 159-163. Sri Kantha S: Scientific productivity of Einstein, Freud and Landsteiner. Medical Hypotheses, 1996; 46: 467-470. Sri Kantha S: Cyril Ponnamperuma – scientist extraordinary. Lanka Guardian, July 15, 1995, p. 19. Tenney M: Kilo-base Goliaths. News in Physiological Sciences, 1993; 8: 186.